They will be about an inch (25mm) smaller that the larger home made one I make out of heavy paper stock, and being slightly smaller will be easier to insert into a zip lock bag. 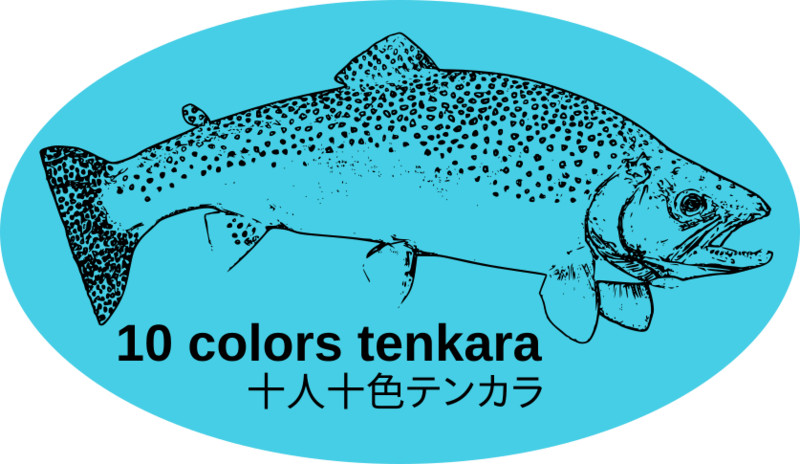 And lacking coloration will also be easy to label without having to glue on a tag. And larger than the small ones I make. They were sized so that in a pinch if I need one I can make them out of a blog in card from a magazine. Having an odd number of points circle, each round passes on a different side of the card so the card wont saucer on me and stays relatively flat. I’ve not yet heard back from Keiichi-san, Bad timing making the enquiry on the weekend. Other times I hear back from him quickly. The cards are not heavy like a magazine or book I am expecting the postage charge to be low. Ah, here’s an FYI that might be of interest. I received a reply from Keiichisan, in which he wrote, maybe the ECO shikakemaki line cards at 140mm were too big, and maybe I would prefer a 75mm alternate card instead. 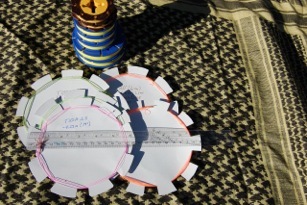 Well, I replied no, I’d prefer the 140 mm cards because I like the larger diameter cards. Unfortunately I sent the reply before I looked carefully at the link he sent me. The Deiichiseiko Spools (product # 5051) are actually available in several sizes, 75mm, 105mm, 136mm, 170mm, and 210mm. 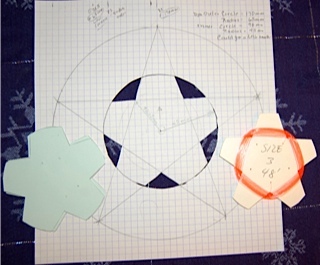 He wrote the 75mm size is $4.80 + $8 shipping to USA for an 8 piece set. Don’t know how the prices or shipping charge would change for the other sizes. I would have been ok with the 136mm size. But since he only mentioned the 75mm size in his email, I failed to notice the other sizes before replying to him. And the ones I had enquired about are 980 yen for ten. So maybe probably twice the price for 2 more pieces, that are only slightly larger in diameter. I think I should email him back about the price on the 136mm 8 pc set. Anyway, maybe one size or the other of these Daiichiseiko I Spool line cards might be of interest. Well here’s an update after hearing back from Keiichi-san again. まきまきシート エコ仕掛巻き（大） 10枚入り from 城東樹脂化工, Makimaki set Eco Shikakemaki (large) 10 pieces. Maybe he saw they would be higher cost for him to order them inside Japan. The biggest bag for the money, for 136mm diameter spools are the Deiichiseiko product # 5048. Spool Sheet ECO Value Pack, $8.00 (for 9 medium sized, 136mm card spools). The Deiichiseiko spools, mentioned in the previous post, product # 5051, Spool Sheet, for medium size, 136mm spool, there are only 4 in a pack for $4.80. Not 8 in a pack as for the smaller Mini diameter spools. So 8 M (136mm ) spools would cost me $9.60. The # 5048 spools are the lower cost option. He also gave me a price for the Deiichiseiko Spool Sheet ECO in EVA Box, product # 5048. It is a cool set with a water resistant zip pouch, and stuff. But the price quoted was $20 for 3M sized spools. Keiichi-san also did not give a different shipping charge from the initial price of $8. I assume the fee will remain the same though I have I have chosen a different product option. About $1.78/spool. I can live with that price, my time to make my homemade spools is worth more to me. But if you like smaller diameter spools, the price per spool would be less. Seems the U$ is buying more JPY that it used to. 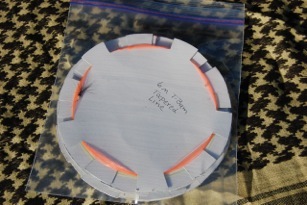 Maybe this was helpful if you were thinking of ordering some size of line sheet spools. Wow! That is a beautiful and unique line holder! I’m pleased you dropped in Jason. Since you’re here - I’ll ask - what’s the eta for the Nirvana line holders? 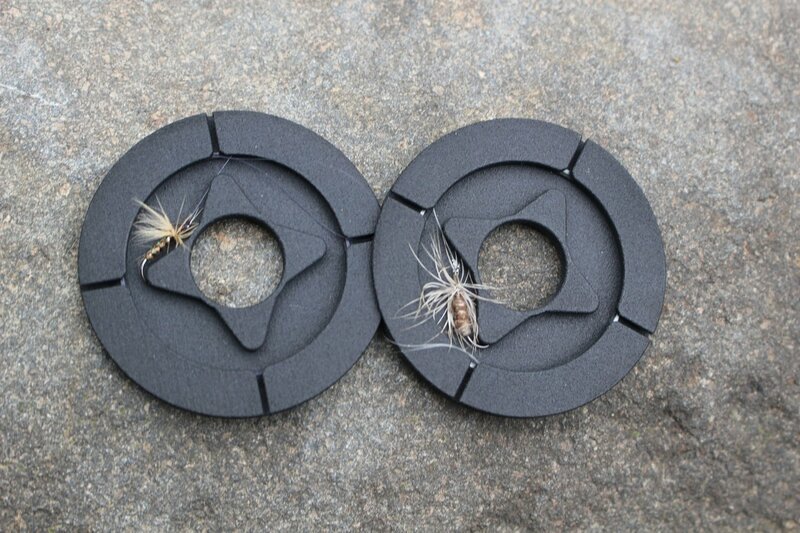 Have any of you used the new Oni spools? Strong lightweight plastic line spools designed by Masami Sakakibara. Inspired by Ninja throwing stars called shuriken. Price is for 2 line spools. $7.00 shipping. I just got a couple and so far I really like them. The Oni Suriken line spools are interesting design. Sadly, in my view, they are only 60mm in diameter, (about the average popular size), but I prefer larger diameter line spools. The 85mm ~ 90mm spools. But might have to check them out as that is the only size. Do you like the larger size because of less line twist? Or easier , quicker to wind? A combination of both. A little quicker to unwind and use line that has coil memory. Larger diameter coils leave fewer curves in the line to be straightened, and the arc of the coils are a little closer to being straight than smaller radius coils. And a little bit quicker to wind line back onto the spool. Both the Meihō (メイホウ) and the (rādji) Raji Leica (ラーヂ ・ライカ) spools tend to make line spools that jump in size by 20mm; from small, to medium to large sizes. The raji leica about 5mm smaller in diameter. An increase of diameter of 20mm = about an extra 2.5 inches (6.35cm) more line wound onto the spool for each wrap round the spool. 5 round turns = an extra foot of line wound onto the spool. Plus I do not find carrying the slightly larger line spools a burden. As some people do. I most often carry everything extra I want on the stream in a Gossamer Gear backpack hip pocket, that I have attached a shoulder strap to. It is about 7 in x 4 in x 1.5 in. Big enough for a small fly box, spool of tippet, my car keys, an extra line spool or two, but it becomes a little crowded with 2 line spools. The line cutter and forceps attached to a dual keeper, the forceps conveniently clip to the belt loops of the hip pocket. I figure if I can’t carry all I need in it, then I am wanting to carry too much stuff. I realize – It is only a small decrease in time, but ever since reading a biography of R. G. LeTourneau, and reading his story about one of the principles he applied to his work I lean toward thinking about time efficiency of doing task. The story he wrote about was when he was a young man, working at one of his first jobs in a foundry. He was working hard shoveling foundry sand like he was putting out a fire, and working up a sweat. The boss walked by and said to him, “Young man I do not require you to work hard - I only require you to work fast.” One of the reasons why he invented and built machines that did work fast. My wife and I are at odds about this. She wants everything in the kitchen stowed behind cabinet doors, out of sight. I want spices, and pans out in the open where I can find and use them quickly. Since I am the chief cook and plate washer now days I favor my view prevailing. But ya don’t always get what you want. 丸型 ライン 巻き 仕掛け that basically translates as - round shape line winding mechanism / device. Of course you can mix the individual words around to make a different search phrase and sometimes find something different. Different model or homemade line spools. Thanks for joining the forum @jasonklass. It’s great to have you here.